Blackta is a new play at the Young Vic Theatre in London investigating what it is to be a black actor in modern Britain. In a tough profession, do black performers face an even harder time finding work on screen and on stage than white actors and actresses? 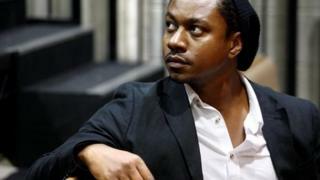 It's six years since the actor Nathaniel Martello-White graduated from The Royal Academy of Dramatic Art (Rada) - one of the most highly regarded drama schools anywhere. Since then he's done well enough, getting roles on TV in programmes such as Law & Order: UK and appearing on stage with the Royal Shakespeare Company. But like many actors a few years out from training, he knows how hard his chosen career can be. Having begun writing screenplays, his first work is now being put on at the Young Vic in London in its 140-seat studio space. Blackta has an all-black cast and focuses on the high and lows of being a black actor. It's partly a satire on an audition process familiar to all performers, but the playwright thinks black people face specific problems. "I was having a coffee with another black actor," he says. "He had a supporting role in a big series on TV but he kept saying to me he felt like a glorified production driver as opposed to a properly developed character. "Hearing that term got me thinking and it's how the play started." Controversially, the four main characters have names based on their complexion - Brown, Black, Yellow and Dull Brown. It's a sensitive area, seldom addressed on stage or screen: how are someone's life chances influenced by exactly how black they are? Martello-White knows audiences may feel uncomfortable with the question whatever their colour, but it's one he was keen to address. "It links back heavily to slavery: they call it post-colonial syndrome," he says. "Sometimes in the black community the whiter your features are, the more attractive you're seen to be. "At my secondary school there was a dark-skinned black guy who had green eyes so he was hailed as a god. Not everyone thinks that way but some people do." Film companies won't take a gamble on casting a black lead because they think white people won't go and see it. The actor loosely based the play on himself and three other black actors he graduated from Rada with. "One was mixed-race, one was a very dark-skinned Nigerian guy and so on. And we all had different views as to how we were perceived by casting directors and others in the industry," he says. "The dark-skinned guy said if there was an African project or something about slavery he'd get a call. And the mixed-race guy said if there's an inter-racial relationship on TV he'd get called in. "But a brown-skinned actor might get more work in America because over there that's who the leading-men tend to be - look at Denzel Washington or Will Smith. I'm not saying all this is 100% true but these were the conversations we were having." Martello-White believes one of the problems is British television's fondness for period drama: "If you're black you're crossed off the list straight away. But why couldn't there be a major black character in Downton Abbey? "If there was a famous writer of colour who turned up looking great in a tux, someone like Adrian Lester could be terrific in the role. Film companies won't take a gamble on casting a black lead because they think white people won't go and see it - we need to press the boundaries." The actor thinks the US is way ahead of the UK in casting black performers - with many black British actors left wondering if they'd be better off going to Los Angeles and trying for a career in a culture which appears to offer richer pickings. "People [in the UK] who were doing pretty well - actors like Idris Elba (Prometheus), David Harewood (Homeland) and Lennie James (Colombiana)- went over to the US and did amazingly. The irony is they came back and were hailed by the British industry." Martello-White says he's also considered going to LA for the pilot season, like so many British actors before him. However there are also many white Brits who've fought for roles in the States, which has a TV and movie industry hugely bigger than Britain's. Jack Davenport and Andrew Lincoln are two recent examples who found success in hit shows Smash and The Walking Dead respectively. "Being an actor can be tough in Britain whoever you are," he says. "It's a small world and I'm not claiming the frustrations only apply to black people." "But I don't want to give up the fight over here. I want to create my own genre as a writer. Blackta is only a start: I'm a firm believer that if something is good and original and provocative, then people will go and see it." Blackta is at the Young Vic from 26 October - 17 November. Is it ever OK for TV dramas to be all-white?